Dimensions (HxWxD): 1" x 0.9" x 1.66"
This amazing Pente Pallasite Altarpiece w/Olivine is a slice of the "Jepara" Meteorite from Java, Indonesia. Meteorites are more rare than gold on earth and very few are what are known as Pallasites. This beautiful gemstone-laced meteorite specimen is large enough to place on your altar as a centerpiece and yet the perfect size to hold in the hand during meditation or crystal healing sessions. 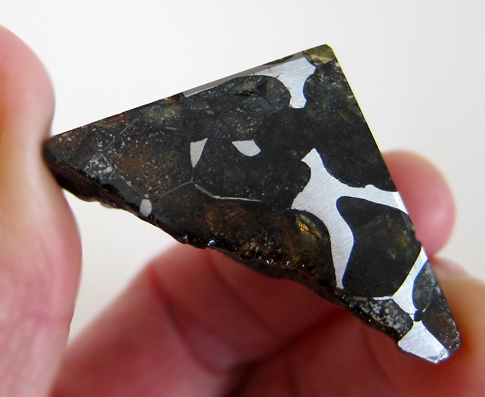 Pallasites are meteorites with an iron-nickel matrix displaying centimeter sized gemstone quality chunks of olivine. Gemstone quality olivine is also known as peridot. The Jepara meteorite originated from somewhere in the asteroid belt between Mars and Jupiter millions of years ago!! 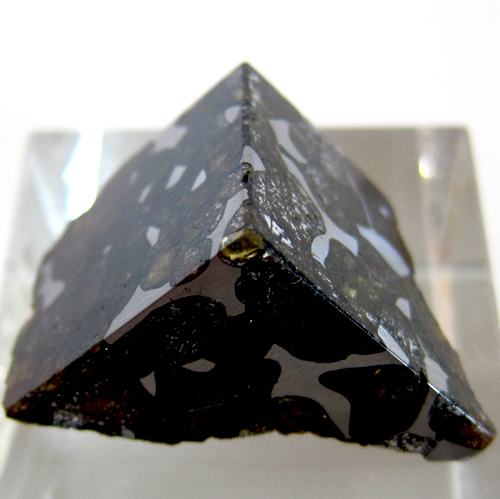 The Jepara meteorite containing olivine was discovered in 2008 in Jepara, Indonesia. Our experience in working and meditating and wearing meteorites is truly inspiring and that is why we have decided to make them available to our customers, many of whom also meditate, work in the healing arts or want to participate in creating the new paradigm shift on earth. We find Pallasites to be not only repositories of Cosmic Energy from deep space but also deeply grounding, making these stones powerful assistants in accessing the Divine, our Higher Selves and a calm and tranquil energy stream. Peridot is said to have been one of the stones found in the breastplate of the high priest of the Israelites in the Old Testament. Metaphysical crystal experts say that peridot radiates a warm, relaxing and cleansing energy, related especially to the third and fourth chakras. Peridot is said to stimulate the heart and solar plexus chakras, bringing the activities of the mind into harmony with affairs of the heart. Peridot helps the bearer to an intellectual understanding of relationships, and to regulate the physical, mental, and emotional cycles surfacing in each stage of the life path. Crystal healers often use peridot to tonify, energize and strengthen the body, which makes sense given its close association with the solar plexus and heart. For the same reason, peridot is used in the treatment of disorders of the lungs, heart, spleen and digestive tract. 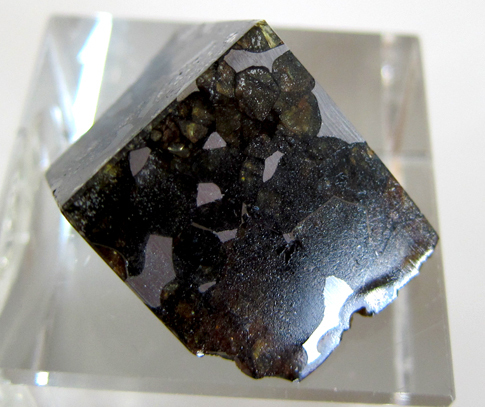 Most importantly, we feel the high hematite content of the Pallasite meteorites manifests as an energy signature with a strong affinity to Archangel Michael and therefore imparts tremendous grounding and a protective energy shield around the body. For those seeking a strong connection to Archangel Michael, for those seeking to raise their energies to the Higher Chakras, and for those seeking to Ascend to Heart-Centered Consciousness, for those seeking to experience the joy and sorrow of Christ’s Compassion toward all beings, and for those seeking to experience the Consciousness of the Cosmic Christ, Pallasite is clearly a powerful Lightworker’s tool, as well as a beautiful and highly prized mineralogical treasure. In late August or early September, just prior to the entry of the sun into Libra during the month of the Autumn Equinox, in the northern hemisphere, the Perseid meteor showers are visible. At this time of year, when sensational meteor showers, largely composed of iron, traditionally streak across the night sky, Esoteric Christian philosopher Rudolph Steiner’s clairvoyant vision saw the traditional flashing iron sword of Michael. 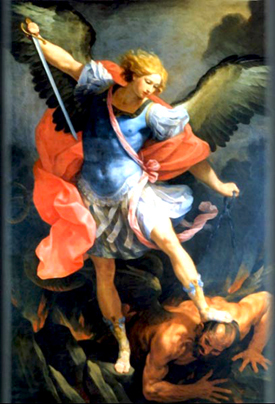 This clairvoyant vision coincided with the traditional Christian Festival of Michaelmas. NOTE: Above weight is shipping weight. Net weight 1.35 ounces or 38 grams.